Let’s face it, everyone has that sweet tooth craving from time to time, and this greatly increases during the Christmas Season where sweets reign supreme in this festive occasion. Truth be told, no matter how much we try to stay away from the holiday sweets, we can’t deny the fact that it is always wonderful to have a bite of delicious Christmas desserts once in a while. Homemade Christmas desserts would be a definite hit for all events, such as the dinner parties that you’ve been planning to host. 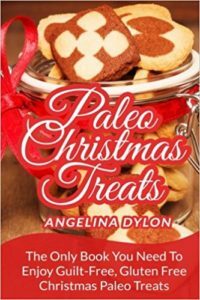 You can easily find varieties of delicacies and cookbooks online, so you can use them to make awesome treats as the perfect Christmas gifts for your friends and families. It comes in a beautiful presentation of gourmet flavors. 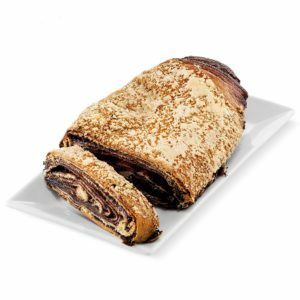 This product contains twelve chocolate sandwich cookies, handcrafted from premium ingredients, including chocolate, nuts, and toppings. 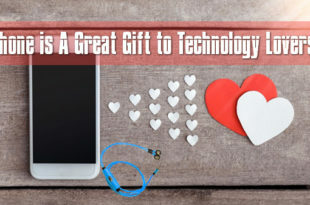 It’s placed in an elegant and classy gift box for your loved ones that can even be personalized with a special message. 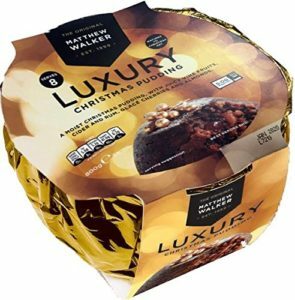 A delicious moist pudding to bring the spirit of Christmas to life. It’s crafted from juicy vine fruits, cider, rum, and almonds, making it a luxurious gift idea. Presenting a perfect blend in a fruity pudding, this product is ideal for 8 servings. 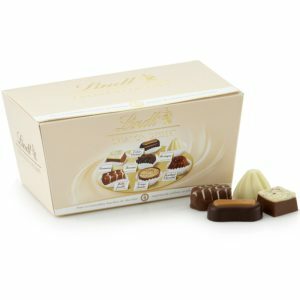 Inspired by classic recipes, these chocolate pralines include an assortment of crème Brulee, tiramisu, meringue, caramel éclair, millefeuille, and chocolate brownie. Packed in 21 pieces, this dessert snack is a perfect gift item for all occasions. Desserts are irresistable when presented properly. 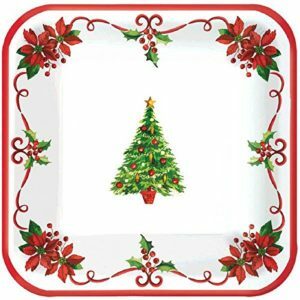 These beautiful square paper dessert plates feature ornately designed Christmas trees and gorgeously flowing Hollies and Poinsettias. They are undeniably pretty, it can hold dry as well as wet food and snacks. Freshly prepared homemade heaven is only a click away. Serve your guests this Christmas season with irresistible filling of chocolate in classic crumb crunchies, and they’ll experience a whole new world of sweets. The absolutely gorgeous sight and enticing smell will make it an awesome treat for any special occasion. For all enthusiastic home cooks as well as bakers, Good Housekeeping presents 75 delectable holiday recipes to try a hand on. 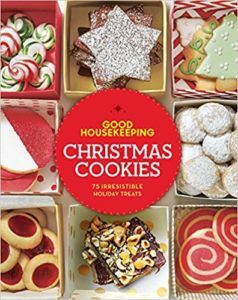 From Gingerbread Cutouts and Chocolate Chunk to Razzy Jazzy Thumbprints toPeppermint Sticks, this book also includes numerous easy decorating ideas and go-ahead tips to ensure that all your desserts taste as well as look amazing. 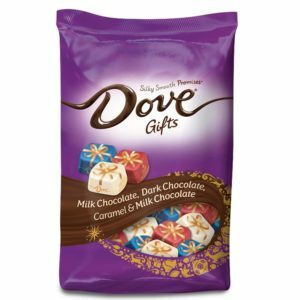 Bringing in candy delight and a premium chocolate experience, DOVE PROMISES has an assortment of the most favorite candy flavors. Surprise your loved ones this Christmas by personalizing each wrapped chocolate with a special message that will brighten up their day. Featuring a unique and festive Christmas theme, this customized gift tower includes a gourmet gift of 19 individual wrapped pieces. The assorted brownie and blondie bars inside are handcrafted with dark rich Belgian chocolate, farm fresh eggs, and pure creamery butter. These tower boxes are slightly customized, it also serves as a great option for food gift baskets. 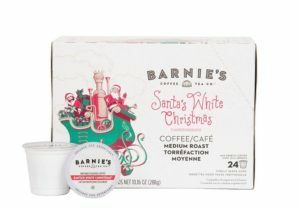 For all the caffeine lovers, Barnie’s CoffeeKitchen brings you 100 percent Arabica coffee. Flavored with sweet caramel, vanilla, coconut and nuts, and medium roasted, they present well-rounded aromas and flavors that will satisfy your coffee cravings with an unforgettable experience. 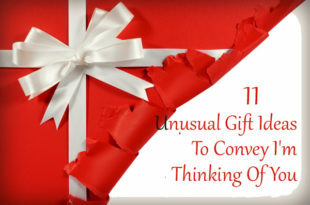 SUGGESTED READ 13 Gifts for 9 Year Old Boys to Brace the Bond of Love! 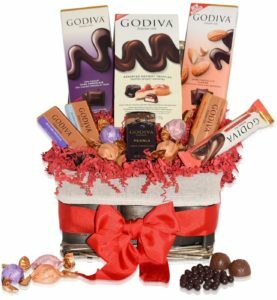 Presenting the most popular and favorite chocolate flavors, Godiva Christmas Git Basket has an assortment of delicious varieties, including truffles with lava cake, strawberry cheesecake, crème Brulee, Godiva bars of milk, and dark chocolate varieties. 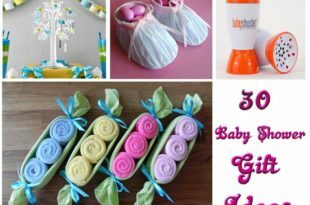 The decorative gift basket is just about suitable for all occasions to send across your token of love and kindness. Handmade and blanketed in white confection or chocolate, these 36 pieces of pure delight are ideal Christmas desserts to spell out the sweetest greetings. The layers of deliciously moist cake have crème fillings rich in strawberry, almond, chocolate fudge, and orange. 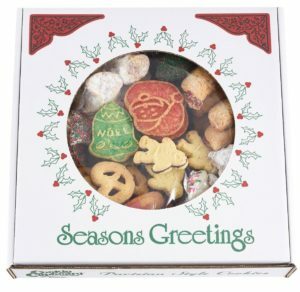 Just like home baked, these European style cookies bring in 11 unique tastes in a box. 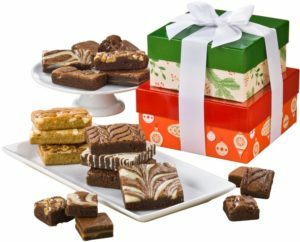 The platter presents a wide assortment of cookies, making it an ideal gift for the holiday season for friends, family, and co-workers. Also, if you are hosting a dinner party for Christmas, the mouth-watering sweetness of these cookies will leave your guests satisfied. 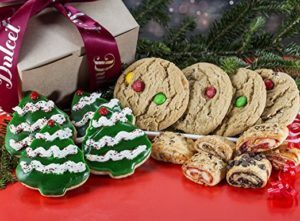 Bakery fresh holiday treats package includes soft cookies, decorated tree cookies, raspberry, chocolate rugelach, apricot, and assorted cinnamon. 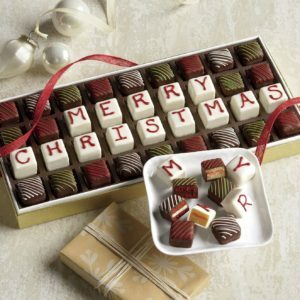 This Christmas gift item is charming, tasty, and overall, a colorful package to surprise your loved ones. 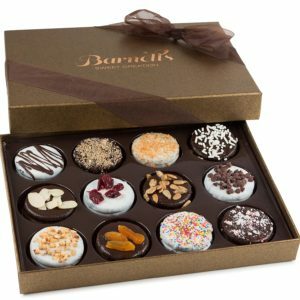 Bringing in the best in taste, quality, and design, there’s nothing that can go wrong with this gift box. 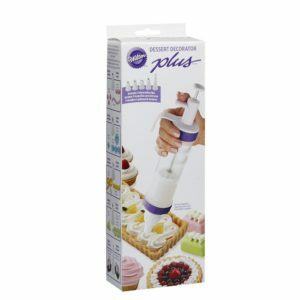 This dessert decorator from Wilton is a pull-out plunger that holds approximately a quarter cup of icing and allows for a quick and easy decoration on cakes and other desserts. 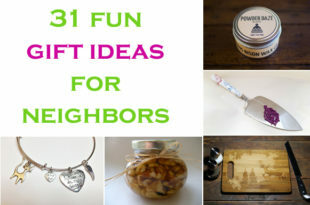 Also included in the pack are tips, instructions, and photos in order to make it easier for you. SUGGESTED READ A Dozen of Christmas Tablecloth to Adorn Your Home this Season! For people strict on diet, this book is a blessing and contains proven strategies and steps for making delicious treats and desserts. You can get easy recipes for coconut star fruitcake, holiday drinks, tasty delicious desserts, and so much more. With Paleo recipes, enjoy gluten and guilt-free treats and dishes made at home. Here’s one of the best, genuine and scrumptious desserts that you can serve on your Christmas dinner party. The Texas Pecan cake is an award winning and signature recipe loaded with the tenderest and sweetest pecans in the world. 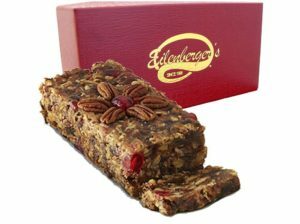 These special pecans from Eilenberger’s Bakery are folded together with cherries, pineapple, chopped dates, and baked in honey butter to bring out the richest and the most delicious dessert.